You know how you are pretty certain that your children are gifted, talented and absolutely unique even though they sometimes drive you crazy? There must be some parental filter in our brains that takes in the data of our kids and somehow skews it so we think they are the next Einstein. This is actually a great thing because it helps on the days that all you want to do is pull your hair out in mommyhood frustration. 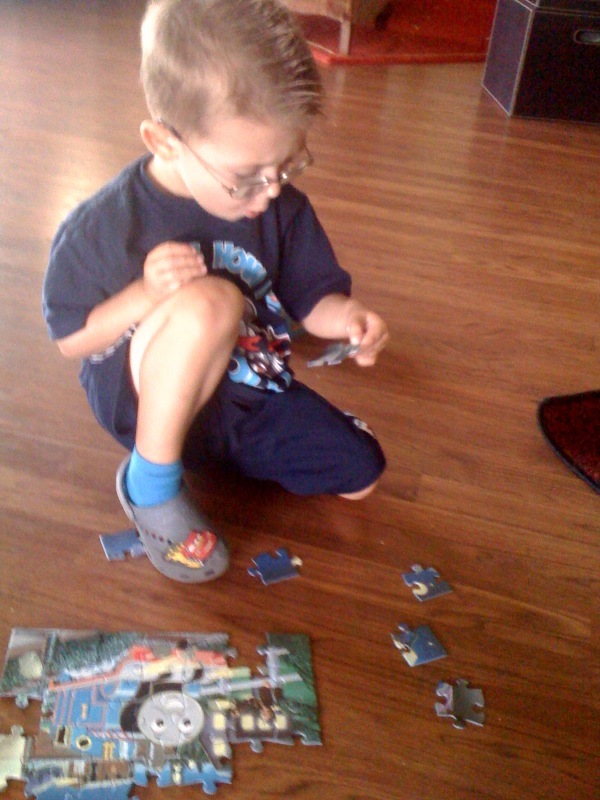 Of course I’m convinced that little T.Puzzle is some sort of puzzle genius. I also believe that we are really good at the things we love (that is why I only kind of like singing and cooking) and little T.Puzzle clearly loves puzzles. We are heading into that time of year where if you aren’t at a beach or the by the pool, your tendency is to want to stay indoors to avoid the heat. This of course is a challenge with someone like little T.Puzzle. I bought him a Thomas the Train puzzle to help occupy our day. It has small pieces and is for ages 4-8. Once we got the puzzle home, he worked meticulously and completely unassisted and had it assembled in no time flat. That brought me down to earth in a hurry. I’m pretty sure when Einstein created all his amazing formulas and theorems, he was in fact, completely toliet-trained. Looks like there still is a long road ahead to genius. well eventually he will not poop his pants and I think you do have little geniuses on your hands 🙂 puzzles are awesome!